You could win up to 500 free spins! Visit website for full T&C's. 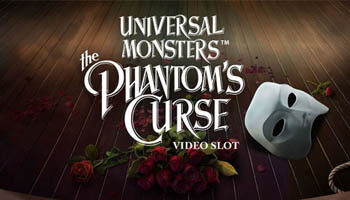 If you dare to cross the Phantom of the Opera, step up onto the stage to play The Phantom’s Curse slot! The video slot from NetEnt has a massive 40 win lines which will have you singing with joy when you win a lot of cash! Keep reading to find out more in The Phantom’s Curse slot review! Lucky Admiral Casino – Jump on board with this site and get ready for a fun adventure within their themed lobby. Top Dog Slots – Get ready for a chance to really win big with this site’s mega wheel, you could even win 500 free spins! Do ensure that you’re reading the terms and conditions before you play. There are 10 symbols for you to win with on this game in the Universal Monsters series. Spin to win with classic characters like the Phantom and Christine as well as a broken mirror and ring. The great thing about this game is that there are 40 win lines and wins are paid from left to right as well as right to left! That gives you so many ways to win! If you want to bag yourself a fortune, you’ll need to match 3 symbols on a win line. To help you with this, you can also use the wild cards to substitute for any symbols that you may be missing. When it comes to betting on The Phantom’s Curse Slots, you’ll need to adjust your bet level and coin value according to how much you are willing to stake on each spin! This is important to ensure that you are playing strategically and not just betting all of your money away. If you think you can handle the pressure, you can use the max bet button to win as much as possible. There is also an auto play button if you’re busy but still want to face the Phantom and defeat his curse. As if this game didn’t have enough ways to win already with the huge amount of win lines, there are also bonus features to increase your amount of coins! 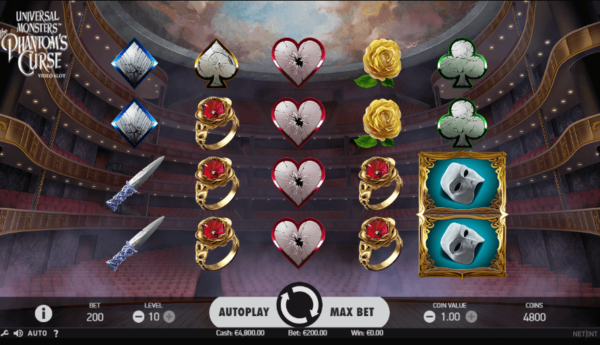 Our favourite bonus is the Pick and Click bonus which will be unlocked when you stack your symbols of the Phantom and Christine on lines one and five respectively. This bonus has two stages and you will click your way through to win your bet multiplied by 20, 40 or 100 coins! It’s hard to talk about this game without mentioning the design. When the game loads, a video begins that gives an insight into the story behind the game. You are then faced with the reels and symbols placed in front of the opera stage in which the story is based around. If you’re a fan of the story of the Phantom of the Opera, you’ll recognise the elements that are included in this game and will be impressed with how it has been adapted. In conclusion, we think that this game is great because of the way that the well-known theme is coupled with an amazing amount of chances to win. Take a trip to the opera and face the curse to be in with winning a lot of money.